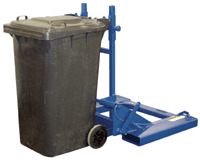 Save time and reduce work-related injuries caused by lifting and dumping heavy waste containers. 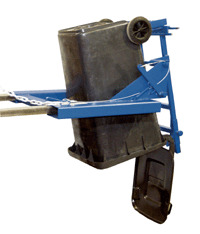 This innovative product will allow a fork truck driver to lift and dump refuse containers weighing up to 1000 lbs. without ever leaving the seat of the fork truck! Secure dumper and lock into place. Once locked into place, transport trash can to refuse container, align and pull chain to dump refuse container contents. Only for use with 64 gallon trash can, model V-TH-64, or apporved equal. Fork pockets are 2.25" H x 7.25" W usable. Steel construction for years of dependale use.